Baysports is a water adventure centre on the shores of the majestic Lough Ree. Located only five minutes from Athlone on the N61, the purpose-built centre is an ideal location for all types of outdoor fun activity this summer. Its impressive list of activities include sailing, kayaking, Chinese dragon boating, pier jumping, bushcraft, team building and much more. Summer camps for children from ages 6 upwards begin in July and cost as little as €35 per day and guarantee a fun and fully supervised water sports activity camp to remember! 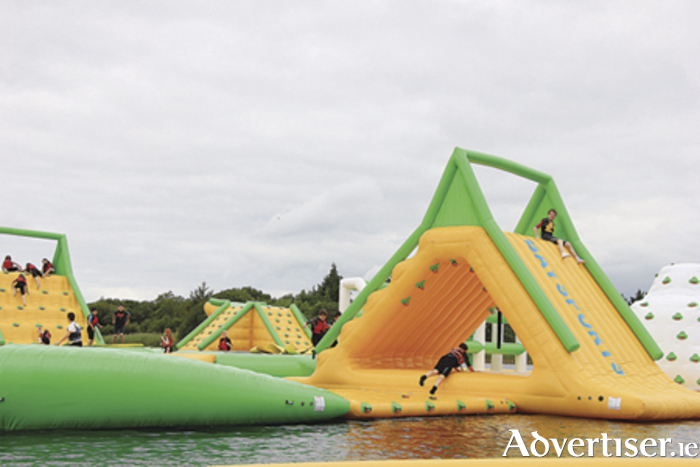 The centre is constantly adding to its range of activities and equipment and this year will see new additions to Ireland’s largest inflatable water park for even more water-based adventure fun; exciting new additions include the Viking slide and rocker boat and Athlone Castle! Covering an area of 1,400 square metres, this floating water park is a major attraction in the region and provides hours of fun for both children and adults alike. With its climbing towers, water trampolines, water slides, and floating icebergs, navigating this floating adventure maze is only limited by your personal quest for fun. For summer camps, family days out, corporate events, or hen and stag parties, Baysports is the location of choice, well worth checking out this summer! Bookings can be made by phoning (090 ) 6494801 or email [email protected].